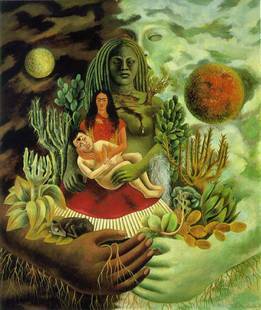 The image “The Love Embrace of the Universe, the Earth, Myself, Diego and Senor Xolotl” is a favorite Frida Kahlo painting. An emphatic world and fecund spacescape is depicted, as every other age and culture knows, as immanent, maternal and nurturing in nature, an embryonic procreative gestation quite now at our personsphere’s natal hour. Akomolafe, Adebayo. The Trees Still Speak: The Collective Intelligence of the Natural World. Spanda Journal. Volume 2, 2014. Bayo, as he is known, is a Nigerian clinical psychologist with a 2006 degree from Covenant University, where he now teaches. He is also an international speaker and poet-activist for a radical advance in collective human experience to a once and future indigenous, spiritual, feminine, organic, life-affirming wisdom and world. From the global South (and East), here is a salutary vision to leaven and enliven the sterile, mechanist, violent, terminal North and West. bayoakomolafe.net Once, I lived on the tarred, lonely highways of truth – slugging towards the looming horizons – the promised dwelling places for those who did not waver. The whole world was about being either right or wrong. I was either lost or found. That was many years ago though. Today, when I meet people, I recognize how utterly beyond right and wrong they are – how their lives are symphonies beyond orchestration, how their mistakes and failings are actually cosmic explorations on a scale grander and of a texture softer than our most dedicated rule-books could possibly account for. You see, something happened on my way – and I lost my coordinates, my map, my directives. Now the whole journey is the destination – and each point, each barren point, just as noble as the final dot. Every splotch of ink is become to me a fresco of wisdom, a beehive of honey, a lovely place – and every aching voice a heavenly choir. The world is no longer desolate and empty and exclusive; she is now a wispy spirit, whose fingers flirt through the wind – a million roads where only one once lay. Assmann, Jan. The Mind of Egypt: History and Meaning in the Time of the Pharaohs. New York: Henry Holt, 2002. The “new kingdom” of ancient Egypt, c. 1500 – 1000, is often seen to exemplify the belief that human life has a cosmic dimension and purpose. The world was knowable to that time because cosmogony is “indefinitely repeated” in nature and person. But with a life-span under thirty years, the human abide and social hierarchy of those Egyptians was wholly oriented to preparation for the afterlife. Barfod, Gry, et al. Revealing Text in a Complexly Rolled Silver Scroll from Jerash with Computed Tomography and Advanced Imaging Software. Nature Scientific Reports. 5/17765, 2015. As the Abstract describes, Aarhus University, Denmark and Ruhr-Universität Bochum, Germany researchers apply 21st century techniques to preserve and transcribe ancient runes. Our interest is then to wonder whomever is achieving this worldwide faculty that can retrospectively recover such vital talismans. As the Abstract describes, Aarhus University, Denmark and Ruhr-Universität Bochum, Germany researchers apply 21st century techniques to preserve and transcribe ancient runes. Our interest is then to wonder whomever is achieving this worldwide faculty that can retrospectively recover such vital talismans. Barnard, Alan. Mythology and the Evolution of Language. Smith, Andrew, et al, eds. The Evolution of Language. Singapore: World Scientific, 2010. The University of Edinburgh social anthropologist proposes that early homo sapiens’ deep propensity to spin narrative stories about the fantastic world in which they stirred to find themselves in played a key role in the hominid advance of complex linguistic abilities. Bastian, Betty. The Cultural Practice of Participatory Transpersonal Visions. ReVision. 26/2, 2003. A Blackfoot Native American on the Faculty of Social Work at the University of Calgary recounts the traditional indigenous wisdom of her people in contrast to the dominant, destructive Eurocentric view. Knowing ones participant place in the cosmos was a basis to act responsibly within a natural order, so as to foster its overall “well-being.” Of course the Western male paradigm denies any such source, from which results our violent, unsustainable state. Bastian states there is an obvious need to reconnect human and universe in their indispensable rapport. Campbell, Joseph. The Power of Myth. New York: Doubleday, 1988. An illustrated entry into Campbell’s lush constellation of mythological insights. The hero/ine myth in its multitudinous versions appears in every culture and epoch to tell the constant story of the individuation of each person and on a larger scale of humankind. Choi, Yeon-Mu and Hyun-Joo Kim. A Directed Network of Greek and Roman Mythology. Physica A. 382/665, 2007. Entry listings in a dictionary of mythic provenance can be seen as nodes in a scale-free, power-law array similar to complex systems found throughout biological, social, economic, and internet domains. Whatever universality might human inquiry and narrative lately be able to realize? Daniel, Stephen. Myth and Modern Philosophy. Philadelphia: Temple University Press, 1990. An historical survey of the linguistic, semiotic and figural dimensions of mythic narratives. Doniger, Wendy. The Implied Spider. New York: Columbia University Press, 1998. In this study of mythologies, the University of Chicago theologian sets aside the postmodern denial of common themes. Rather it is obvious that just as all languages can be translated one into another, so the mythic versions and testimonies should equally be comparable and commensurable. Microscope, telescope and our human kaleidoscope necessarily reflect the same story.